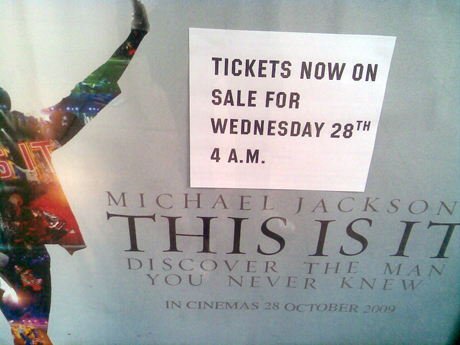 Tonight: 1 of 25 global premieres of Michael Jackson’s slightly-crap-looking This Is It will take place at the Odeon Leicester Square at 1am, to coincide with the 6pm start of the film’s LA premiere. Public screenings will start as early as 4am. Yes, 4am. They reckon it’s going to break box office records. I won’t be contributing.